Black and Pink Star Showers Cellophane Roll 24 inches wide x 50 ft long. 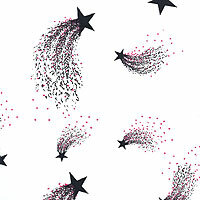 Black stars with sparkles shooting in a tail shower of black and pink colors. Cello background is clear.